AURORA, CO. - July 19: Tom Sullivan, father of 27-year-old Alex who was killed in the Aurora shooting, speaks at the remembrance event for the one year anniversary at Smokey Hill Shelter in Cherry Creek State Park. When will enough be ENOUGH? The recent acquittal of George Zimmerman in the case of Trayvon Martin brings to light a most serious issue plaguing our country today: local Stand Your Ground and "Shoot First" laws actually exist, and this is a prime example of the worst that can happen when this type of law is voted in by the local public and upheld. It's not only time to rethink how we vote, but also to understand the important role local elections play and to show up when they are held. Across the country, there will be many local primaries after Labor Day. Often times there are measures on the ballots which ask the voter whether or not s/he wants this specific measure to take effect. It is wonderful that we have the freedom to be able to decide local laws with a "yes" or a "no", unencumbered by an Electoral College. But the problem is this: do people show up for local elections? The sad truth is many do not. The "Stand Your Ground" law was the main law that the defense used to keep George Zimmerman from being jailed. Would the public have voted "yes" for this law if they could have foreseen the outcome of the shooting of Trayvon Martin and subsequent case? If the community knew that an unarmed teen from their own neighborhood would be shot and killed by a man with a gun, would they have voted "no" instead? The outcome of this case was earth-shattering to many across the nation. Will the same people that are infuriated by this outcome connect the dots and show up to all future local elections? In addition, are there local laws that make it hard for working people to come out and vote? We pose these questions because we are gravely concerned. The ENOUGH Campaign and its volunteers charge you with the task of not only making sure you vote in your upcoming local elections, but making sure your neighbors and friends do, too. In addition, find out more about your local voting laws and make sure that the entire community has access to voting. Zoning laws can be tricky and voting places often change from election to election, making it harder for people to cast their vote and have their voices be heard. The fact remains that George Zimmerman is a free man after he shot and killed an unarmed, underage Trayvon Martin. What he did was deemed legal by the court. America's love for guns has gone too far - that we, the public, have voted in Stand Your Ground laws that protect the killer and not the victim. Vote in your next local election. Vote in all future local elections. Get others to vote. And make sure that you and everyone you know has access to voting. I'd like to end this by saying, "Let's not let this happen ever again," but the truth is, as long as there are Stand Your Ground laws, it most certainly will. The Second Chance on Shoot First campaign is a coalition of civil rights leaders, elected officials, law enforcement professionals and other Americans committed to raising awareness about "Shoot First" and other unsafe gun laws. It's time to end "stand your ground" and other such laws that undermine public safety, senselessly put people at risk, and enable the kind of tragedy we've witnessed in the case of Trayvon Martin. Since 1993, Connecticut Against Gun Violence has focused on reducing gun violence through public education and legislative advocacy. Please mark your calendars for September 28, 2013. The conference will be held at Wesleyan University, 279 Court St, Middletown, Connecticut 06457. See you there! Americans have stockpiled almost half of the privately owned firearms in the world. Also? The U.S. boasts 88 guns per 100 people, by far the highest rate of private gun ownership on Earth. Next on the list is Yemen, with 55 guns per 100 people. The link below takes you to an eye-opening essay by Matt Bennett on guns in America and how this issue has shaped our country - in particular to the families affected by the tragedy in Newtown, CT. Please read The Brookings Essay, The Promise: The Families of Sandy Hook and the Long Road to Gun Safety. Our friends at Newtown Action Alliance are planning a visit to Washington DC on the 9 month anniversary of the Sandy Hook massacre. A press conference and public demonstrations to mark the nine-month anniversary of the Sandy Hook Elementary School shooting and to demand congressional action on gun reform. Speakers at the press conference will include key congressional leaders and gun violence victims and families from Newtown and other communities. are often compelled to comment on their environment and the issues of the day through their medium, in particular after tragedy. Whether or not you are a fan of country music, this song, among all art forms that touch on gun violence, keep the conversation going. We'd like to know what you think of this song. This past week marks the one year anniversary of the movie theater shooting in Aurora, Colorado. 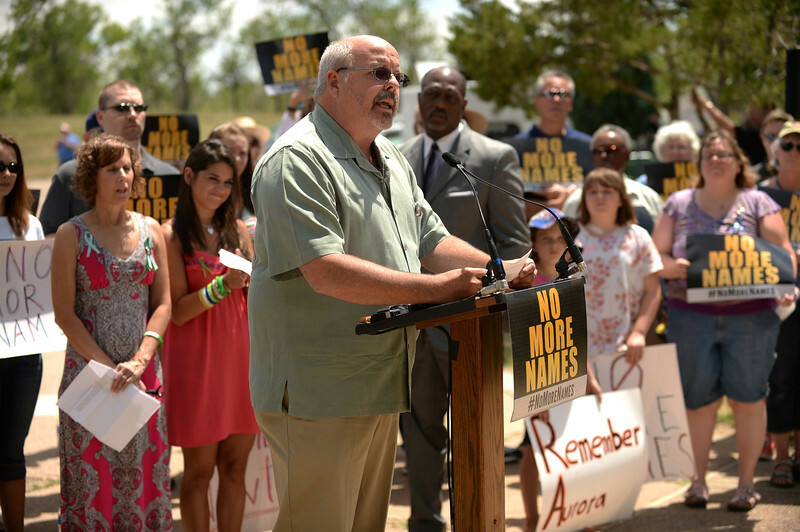 The remembrance event for the one year anniversary of the Aurora theater shooting took place at Smokey Hill Shelter at Cherry Creek State Park in Aurora, Colorado July 19, 2013. Participants, including survivors and family of victims from Aurora, Newtown and Columbine, gathered to read the names of thousands of gun violence victims from across the country. 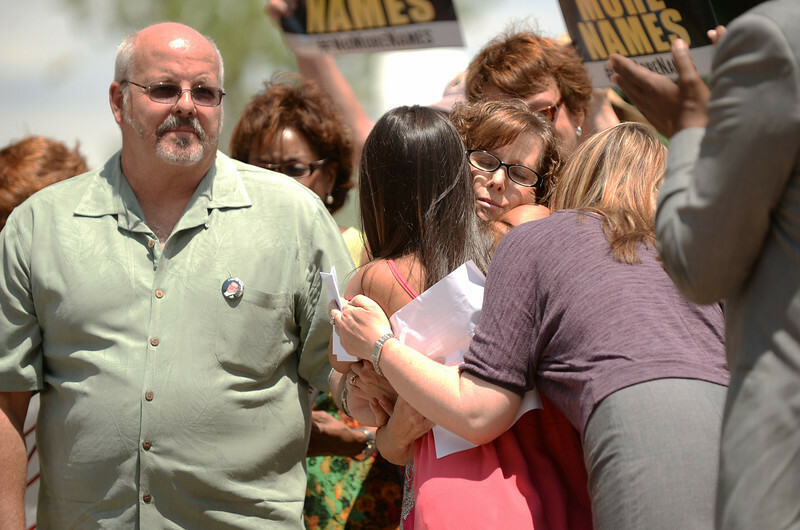 Many who attended held signs with a phrase that rang loud and clear: No More Names. The photo above photo: Tom Sullivan, father of 27-year-old Alex who was killed in the Aurora shooting, watches (front from left) Carlee Soto, whose sister Victoria, a teacher at Sandy Hook Elementary School, was killed in the Newtown shooting, Jane Dougherty, whose sister Mary Sherlach, a psychologist at Sandy Hook Elementary School, was killed in the Newtown shooting, and Coni Sanders, whose father Dave Sanders, a teacher, was killed in the 1999 Columbine High School Shooting, comfort each other. Also marking the first anniversary of the Aurora movie theater massacre, another group rallied nearby to support the Second Amendment. Tweet using the hashtag #NoMoreNames to lend your voice. ENOUGH is growing! Thanks to you, we have more than 500 friends on Facebook and well over 400 followers on Twitter. We also now have more than 800 subscribers to our newsletter. We are so grateful for all those supporting our mission to end gun violence. We cannot do this without your #voices! If you're addicted to social media like we are, we have just the thing for you! "Like" The ENOUGH Campaign on Facebook and follow us on Twitter. Here you'll get up-to-the-minute news, relevant news story links, petitions to sign and more. We love when our friends join the conversation, and we look forward to your points of view. Let's talk!